The Collab Blog: Why Do We Give Homework? 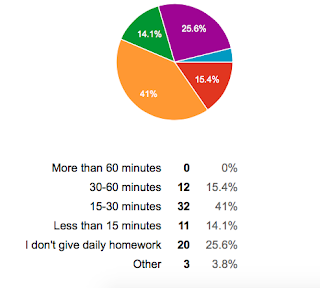 As a project for the District 214 Mentor Program, I recently sent out a survey to my school to find out what teachers really think about homework. The process alone of writing this survey was an educational one. I had the chance to collaborate with Rebecca Castro, a colleague at Wheeling who was doing a similar project. I also got feedback from several peers and administrators before sending out the questions. Their comments and corrections were incredibly helpful as I approached this touchy subject. What is the main purpose of your homework? What type of homework do you usually give? What percentage does homework occupy in your overall grade? How much time should it take students to complete your homework? What percentage actually complete it on time? 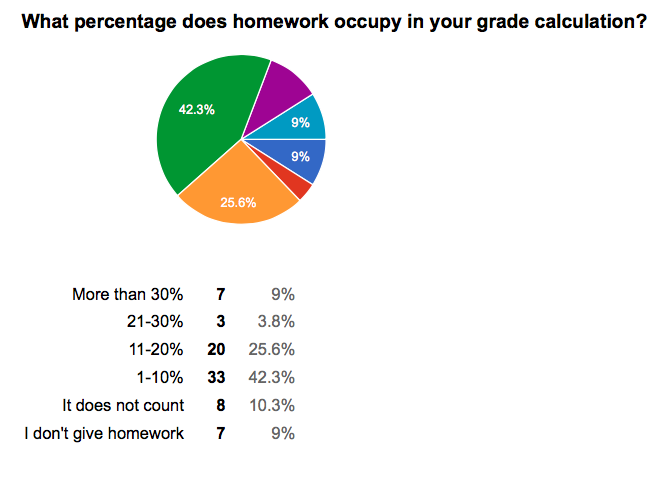 Why do you think some students do not complete homework? What are the consequences in your class for not completing homework? 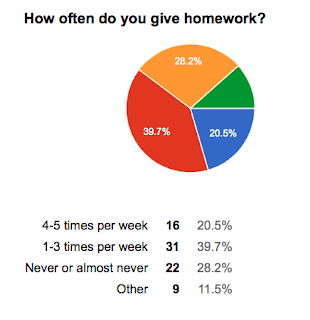 How long should it take students to complete your homework? Most teachers reported that they offer students opportunities to earn credit for late work. 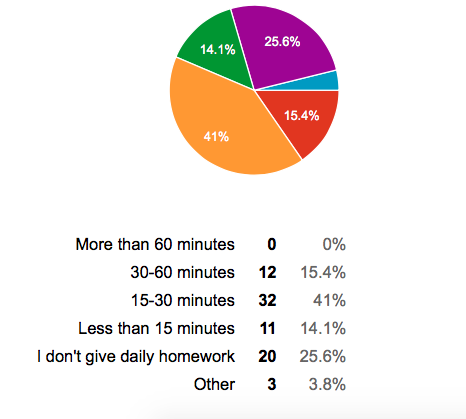 When asked about the reason that most students do not complete homework, the most popular response was that our school culture makes it acceptable not to turn work in on time. 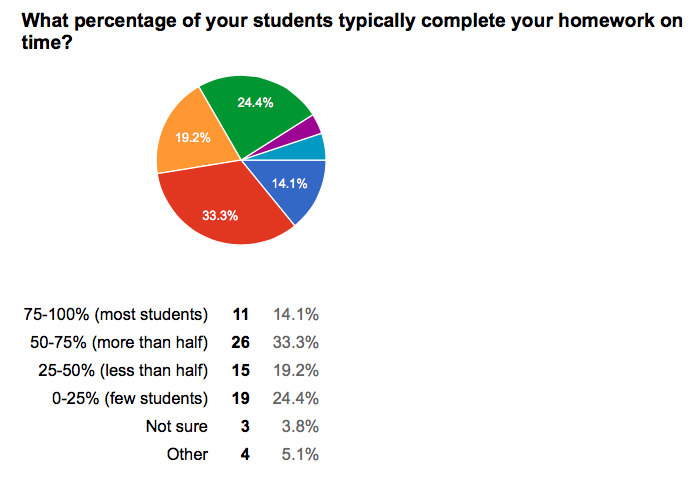 Teachers also recognized that students' time constraints and lack of interest contribute to low completion rates. Some teachers (almost 20%) say that their colleagues assign too much homework and that this impacts students' ability to complete work for other classes. The final question of the survey was an open-ended one. I wanted to know if teachers had any suggestions for improving the homework completion rate at our school. I was surprised at how many people took the time to give thoughtful responses. Some expressed frustration. Others talked about all the time commitments and other challenges that our students face outside of class. Many talked about the idea that students often don't do homework when they don't see the reason or purpose behind it. There seemed to be two major fields of thought. A significant group of teachers say that we need to assign credit (points) to homework and enforce strict deadlines in order for students to take it seriously. Another group of teachers say that homework must be clearly linked to assessments and that students will complete it (even without earning credit for it) if they see the purpose / value in it. While this was only an informal survey, I hope that this exercise can be used to spark some meaningful discussions in the future about the purpose and relevance of homework to our students' learning. As I move into Summer, I am carefully reconsidering the role of homework in my own classes for the 2016-17 school year. Not always I can spend my free time on doing the homework, I think it's too much work in nowadays for students. So I figured out that I need one assistance for it, and found this in https://www.assignmentexpert.com/ face of this team. They made all the best for me, and were always ready to help, when I have some questions about. I know that I should pay attantion for study, but some of subjects are just boring to the tears, and it is better to ask th help, better than do it by my own.